When I was a kid, on super hot days my mom would declare it too hot to cook, and would whip up a batch of Cold Macaroni Salad with Ham. 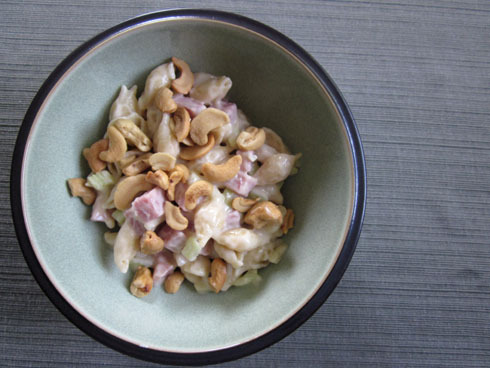 So now that I’m an adult, when it’s hot and humid, the only thing that appeals to me is Cold Macaroni Salad with Ham. It is the perfect combination of light-rich-sweet-saltiness that hits the spot when its piping hot outside. It is easy to make, and keeps for a few days in the refrigerator, as long as my kids don’t live with you. I’ve modified the original recipe a little to make it slightly lighter and less oniony. We usually serve this as a main meal, but it would make a fine side dish as well. In a pot of boiling water, cook macaroni shells until al dente. Rinse under cold water and drain. In a large bowl, add cooled macaroni shells, ham, celery, onion, and salt. Stir to combine. In a small bowl, mix together mayo, brown sugar, vinegar until well blended. Pour over macaroni mixture, and stir until everything is coated in dressing. Refrigerate for at least one hour. When ready to serve, scoop into a bowl and top with a few cashews.